I discovered Remind over 3 years ago through a fellow educator on Twitter. I tried Remind (at that time it was called Remind 101) and I was immediately impressed with the potential of this tool. I was teaching a class at the time and I had my kids test it for me. It was a great way to remind kids about upcoming exams and assignments and also remind them to bring certain materials to class. Kids today seem to always have their phones with them and text messaging is their number one way to communicate. I have tried many ways of getting information to students (daily announcements, emails, visual announcement (monitors in hallways), etc.) and I have determined that Remind is the BEST way for teachers to send announcements to their school communities. As a high school administrator and technology leader, I shared the tool with my staff (and at district technology PD sessions) and the feedback that I received was amazingly positive. It is easy for students and parents (not to mention teachers) to sign up for a class. Just post or project the info for your class. It takes literally seconds for a teacher to create a class…and it takes even less time for students and parents to sign up. 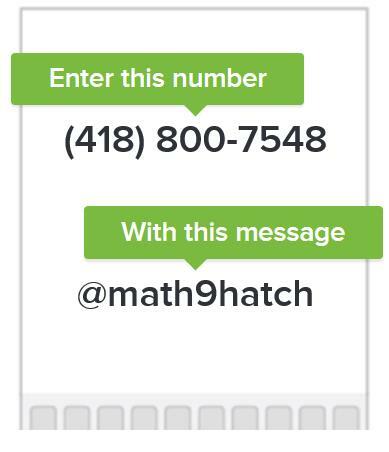 Once a student texts the information below, they are asked to send their name and that is the last time that they can write a text response to any of the teacher generated messages. Remind is great to remind kids about tests, assignments or anything else. I just finished sending a message to my Technology class…”Please remember to bring cameras to school for tomorrow’s class”. Remind works great for clubs and teams or any other groups that do not meet regularly. I used it for a Cross Country Running team that I was coaching and it was extremely valuable…it also prevented some major frost bite. I could send out messages like, “It looks like snow for the race tomorrow…make sure you dress WARM!” When we are at a XC meet and my athletes are separated, I can use the Remind app on my iPhone to let them know where to meet. Teachers can send messages using Remind and they do not share (or have access to) any personal information. No phone numbers are recorded. Teachers get a list of the members of their class based on what the student types in when they sign up. Remind can be used from your desktop or by using the app on your phone. Remind does not let you play favorites…when you send out a message it goes to EVERYONE who is signed up. Our Provincial Teachers’ Association reminds us that having personal text conversations with students is not a good idea. There are a few new features that are quite useful. Now, teachers can send attachments or record voice notes and send those out. Messages can also be scheduled…want to remind kids about a lunch time meeting? Write the message and schedule it to be sent out right before the lunch time bell. I would recommend that you try Remind for your student/parent groups. There is no better way to send out timely information. I was so impressed by Remind that I dedicated one of the sections in my iTunes U course to it. If you have any other uses of Remind, please share them in the comments section below. Yes, it is a great program! I didn’t know about the recording option. I’ll check that out. Apart from updates, I tried to use it as an exam prep tool last year. I wrote a list of questions and answers covering the key ideas from the semester (English 20-2). I got a list of interested (guinea pig) students. I then had the questions sent out every 3 hours or so for 4 days leading up to the exam. 10 minutes after a question was sent, I delivered the answer. Next Next post: FrontRow – I applaud your customer service!